Description: This program performs computer configuration analysis and diagnostics. It gives detailed information about your computer hardware and devices operational modes, including undocumented information. This program also creates a report file, and is able to run in batch mode. The DOS version is especially designed for system restore purposes and may be used by repair professionals, Windows version also available. Description: Computer Driver Update is a professional driver management tool features both driver management and hardware diagnostics. Computer Driver Update provides such practical functions as driver backup, restoration, update and removal for computer users. If you often reinstall your operating system, you may not forget such painful experiences of searching all around for all kinds of drivers. Description: Small tool for displaying the CPU clock, CPU usage, RAM usage! If you own an ASUS mainboard, use the CrazyInfo_ASUS.exe. You get additional infos about the CPU temp. 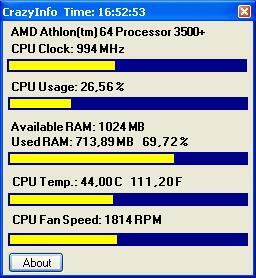 and the CPU fan speed. First you must have installed Asus PCProbe. Then copy the CrazyInfo_ASUS.exe into the PCProbe directory and run it. Description: Dodge Charger Restoration Tools & Software! Description: Driver Update Check is a professional driver management tool features both driver management and hardware diagnostics. Driver Update Check provides such practical function as driver update. Description: Would you like to automatically update your drivers? Driver Update Database has the world's largest driver database. Its fast scan is guaranteed to identify the right driver for your system. Description: Driver Update Office manages your PC to get 100% up to date Drivers and optimize PC performance. Driver Update Office is a powerful driver manager for Windows. Description: Driver Update Tool is a professional driver management tool features both driver management and hardware diagnostics. Driver Update Tool provides such practical function as driver update. Description: Driver Update Window is a professional driver management tool features both driver management and hardware diagnostics. Driver Update Window provides such practical function as driver update. Description: Would you like to automatically update your drivers? Driver Update Windows has the world's largest driver database. Its fast scan is guaranteed to identify the right driver for your system.